On top of the amazing Wanderlust collection from KBShimmer (review + swatches here!) 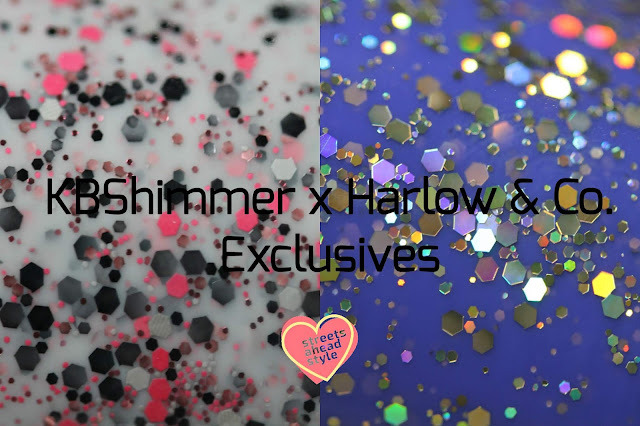 that's launching on Harlow & Co. this Friday, Christy created two adorable crellies exclusively for Harlow & Co. customers! My I present to you KBShimmer Coral of the Story and Regal-ize It. KBShimmer Coral of the Story is a milky white crelly loaded with multiple sizes of black and coral glitters and a sprinkling of rose gold micro glitter. My photos show three coats plus KBShimmer Clearly On Top. This needed the three coats for full opacity and all that crelly goodness but the formula was excellent and smoothed out completely with top coat. KBShimmer Regal-ize It is a Royal purple crelly jelly with multiple sized gold hex glitter. Regal-ize It has a squishy base that builds up perfectly in three coats and the gold hex glitters show through so well. This is a really fun polish and I love the shade of the base. Three thin coats plus top coat which smooths it completely. These crellies aren't bumpy at all which is good news for everyone.